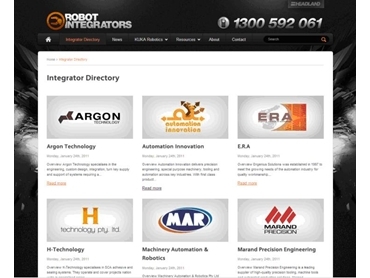 Headland Machinery launch Robotics Integrator website. Headland Machinery has launched a new website, Robot Integrators to assist Australian manufacturers find appropriate robots as well as the correct integrator to advise, design and install their robotic solution. Integrators have vast and varied fields of expertise making appropriate and optimal integrator selection difficult. “Our website makes it easier to fast-track who is the best integrator for the job,” said General Manager of the Robotics division at Headland Machinery, Greg Sale. The website separates integrator’s areas of expertise and offers over-the-phone support for users in addition to information on service providers for safety equipment, welding, switches and end effectors. First-hand accounts and reviews on robot integrators are provided through case studies on previous projects and video interviews. Companies can get an indication of market perception through existing customer comments. Manufacturers can also submit enquiries direct to the right integrator in their field of manufacturing expertise. The website is the first step in providing a comprehensive guide for manufacturers requiring robot integrators. Further information can be gleaned from the site through links to latest robot integrators and products from German manufacturer, KUKA Robotics.